Can you identify any of these employees? 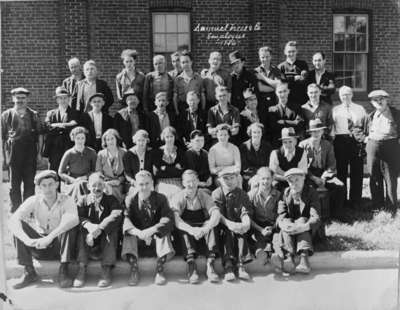 A black and white photograph of the employees of the Whitby Maleable Iron and Brass Company, 1936. In the front row, second from the left, is Joseph Cowx. The buckle factory was one of three main industries in Whitby during the early 20th century. Whitby’s main industries at this time were a buckle factory; blanket factory and tannery. The Buckle Factory, as it was locally known, was in operation from 1888 to 1964. Located at 300 Brock Street South, the Buckle Factory was on the west side of Brock Street between Dunlop and Gilbert Streets. The buckle factory manufactured saddle hardware in Whitby, especially brass buckles for horse harnesses. The buckle factory was started in 1887 when Samuel Trees Senior and George V. Martin purchased O’Donovan Carriage Works. New buildings were constructed on the site and the old buildings used by O’Donovan Carriage Works were used to start “Martin Manufacturing Company”. Martin Manufacturing Company was run from 1888 to 1904. In 1904 the company was bought and run by Fred Hatch as “Hatch Manufacturing Company” until his death in 1929. In 1929, the company was purchased by Samuel Trees Junior and renamed “Whitby Malleable Iron and Brass Company”. It was operated as “Whitby Malleable Iron and Brass Company” until 1964 and in 1966 the buildings were demolished. Whitby Malleable Iron and Brass Company Employees (also known as the Buckle Factory), 1936, Photographer Unknown. Whitby Archives 15-001-003. Scanned from copy negative dated 1971.